Strengthening the family unit and, in particular, providing support to young parents, have made a real difference in two Cape Town suburbs, where poverty, gangs and violence are features of everyday life. A social development think-tank, the Centre for Justice and Crime Prevention (CJCP), is tallying the lessons learned over the nearly five years in which they have piloted their Family Preservation Project in the Cape Town communities of Wesbank and Belhar. The project is unique in South Africa, where very little research and few interventions have been done into the risk factors that contribute towards determining a young person’s vulnerability to becoming involved in crime. The project is a collaboration between the CJCP and the Western Cape Department of Social Development, which has funded the pilot project. Community members, schools and project staff are also partners in the project. Belhar and Wesbank have high levels of poverty and unemployment, gang violence, substance abuse and child abuse and neglect. Both communities are remote from parts of the city where social and economic opportunities are concentrated. Wesbank is a post-apartheid neighbourhood established in 1999 with a diverse, low-income community of residents. While the quality of infrastructure in the area is good, the settlement is far from economic opportunities. There are few community facilities with no police station, day hospital or library. Belhar is different, with more community facilities, more middle-class residents and a longer history. It also has a substantial number of households negatively affected by poverty and unemployment, crime and violence. ‘There are no quick fixes,’ says project social worker Anthea Davids. The interventions are designed to ‘preserve’ and build family structure so that young people have the support they need to finish school and progress on a path to adulthood and a future of opportunity. To do this, the programme has developed a multi-pronged approach to make the family unit cohesive and strong. There are two social workers and a 10-person team of male and female family care workers. They interact daily with community members, whom they see as clients. A typical day starts with a staff group session, focussing on priority cases and planning group sessions. Between mid-morning and early afternoon the family care workers carry out home visits. Later support groups take place at schools and the project offices. Group work includes kids clubs, teen clubs, parent support groups, grandparents support groups and more. Some of the groups are gender specific. Motivating young people to finish matric is one of the project’s main aims, as the CJCP’s research shows that young people who complete school are less likely to engage in crime. 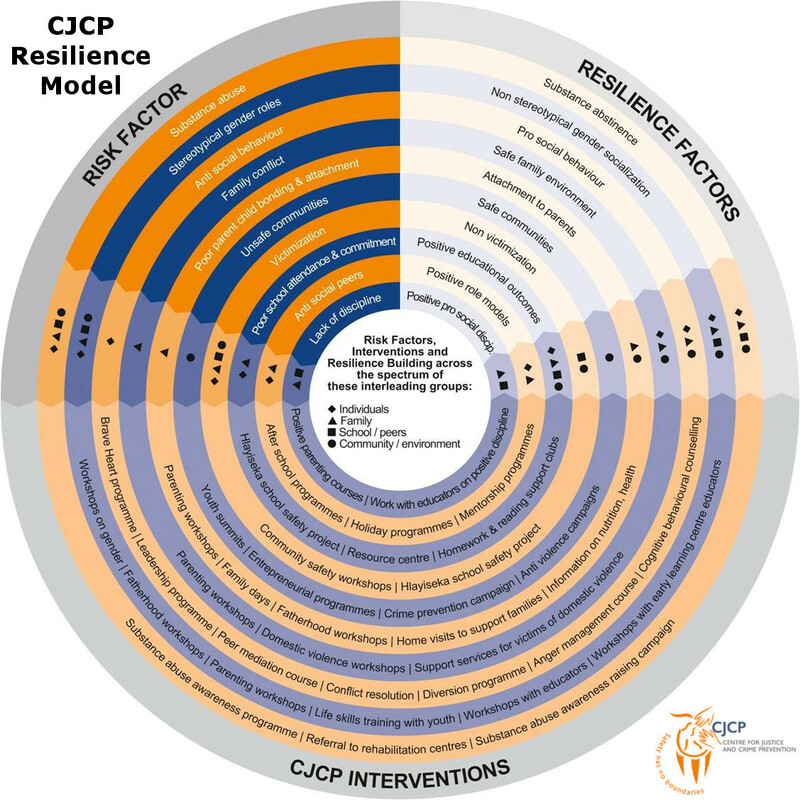 This and other research findings contributed to the development of the CJCP’s resilience model, which informed the kind of interventions that the project would pilot. A central aim of the project is to divert youth from participating in crime. The model sets out `risk’ and `resilience’ factors that help to predict whether a young person is at risk of becoming a criminal, or whether they are resilient to this. Risk factors include substance abuse, stereotypical gender roles, anti-social behaviour, family conflict, poor parent-child bonding and attachment, unsafe communities, victimisation, poor school attendance, anti-social peers and lack of discipline. Factors which promote resilience include substance abstinence, non-stereotypical gender socialisation, a safe family environment, attachment to parents, safe communities, non victimisation, positive educational outcomes and positive role models. The diverse range of interventions and approaches has had positive results for many of the participants. The project is viewed by the community, its clients and staff as very successful. The interventions have improved the quality of life of participants with quantitative measures of success including reduced teen pregnancies, reduced absenteeism and premature school leaving and reductions in the level of crime and violence. Interviews with community members and staff point to a successful project with many highlights. For young people in these communities the project has provided support, entertainment and education, while the staff and family care workers are palpably enthusiastic about their jobs. As the programme draws to a close in 2015, tracking research against the initial benchmark undertaken by the CJCP may also be able to indicate where there have been improvements in quality of life. A strength of the project is its services for teenage mothers. For example, Jasmeen Koopman was 17, pregnant and had dropped out of school. With the encouragement of home visits and support groups, she completed her schooling and is studying for a nursing diploma. Providing sexuality training, beginning at primary school, has also made a marked difference. At one local school, Excelsior High, the teen pregnancy rate was zero in 2013 for the first time. Sexuality training focuses on empowering young people. Schools invite the team to engage with learners in Life Orientation classes. Davids says the focus is on providing information needed to make informed choices and not moralising. The project has a strong focus on young men, with male family care workers facilitating a range of interventions. Bi-weekly support groups for teen fathers are led by care workers who are parents themselves. They emphasise that fathers are part of the family unit, even if they no longer have a relationship with the mother of their child. Relationships between father and child are encouraged, with mothers urged to give access, to reduce the high rate of absentee fathers in the community. For young men who may not have positive male role models, group work and one-on-one encounters can help to close this gap. Regular excursions, Table Mountain hikes and visits to institutions like the University of Cape Town signal that there is a world outside of endless possibility. There is also support for early childhood development (ECD). Most ECD centres or community crèches are not formally registered with the state, which is a requirement for facilities with more than six children. They must meet a range of requirements, from having dedicated premises to having a formal programme of activities, safety measures and some formal training. Community crèche owners are helped to meet the requirements of registration, with one now formally registered. The main challenge confronting the project, its staff and its clients, is the strong presence of gangs. Gangs and the drug trade fill a gap for many young people by providing a sense of community and ‘jobs’ or a source of income, which may allow a young man to `put food on the table’. In Wesbank the CJCP’s baseline study shows that 28% of household heads were either unemployed and seeking work, or long-time unemployed and not seeking work. In this context gangs provide opportunities that the formal economy does not. Organised crime and violence is an ongoing challenge directly affecting the project when its clients are killed, which takes its toll on all. The removal of children from clubs and programmes has also happened with children being groomed for a role in a local gang. The five-year project draws to a close in 2015 and its future is unclear. The CJCP plays an important role as a research institute and this project and others have provided a basis for qualitative and quantitative research into what works and what does not work with respect to youth diversion and family preservation in South Africa. This is relatively new terrain in South African development, where much of the emphasis is on the role of infrastructure in poverty alleviation and quality-of-life improvements. In many developed countries, social work and family-care services are provided by the state, while in South Africa social development services, which are a provincial competence, are often not available and are usually provided by implementing agents drawn from the not-for-profit sector. While community volunteers may be able to provide some of these services going forward, it seems unlikely that this under-resourced community would be able to provide all of the skills and infrastructure needed to continue providing the range of professional services that the project has been able to offer. The projects have shown evidence that this social worker-driven intervention delivers for a community, and that they are worthy of public funding and rolling out on a larger scale.